Nothing is easier than a monochromatic color palette because it takes the guesswork out of color theory. A monochromatic palette is varying lighter or darker shades of one color. In this case, the doors are the darkest color in the palette and some of the hardware, such as the hinges, have been painted to match. The house's vinyl siding is the lightest of the three colors, and the trim work around the doors is the in-between shade. The double doors each have two panels of differing sizes. The top panel is square. Both panels are raised. The brushed brass hardware blends into the color of the door. Hardware pictured includes a lock and a door handle, and the exterior plate on what is likely an interior-only dead bolt. 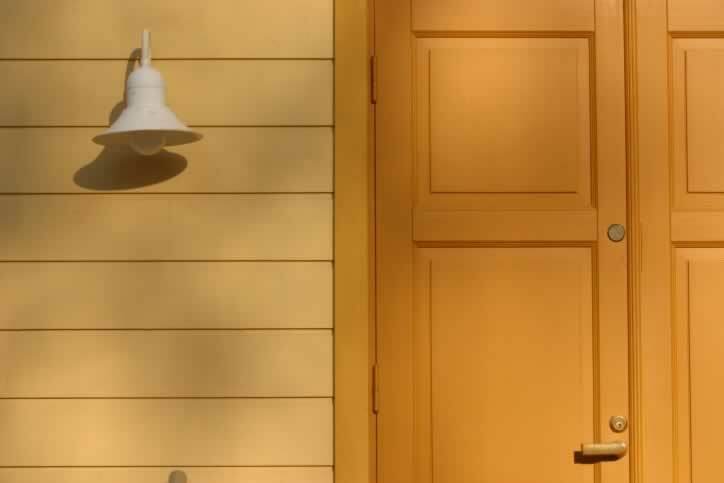 A white, metal outdoor porch light is the only contrasting element.